Noah Naylor. Photo: Amanda Fewer. Height/Weight: 5’ 11” 190 lbs. Previous teams: New York Yankees Scout Team, Canada PG Gold, Mississauga North Tigers. Previous coaches: Mike Steed, Ray Fagnant, Chris Naylor, Sean Travers. 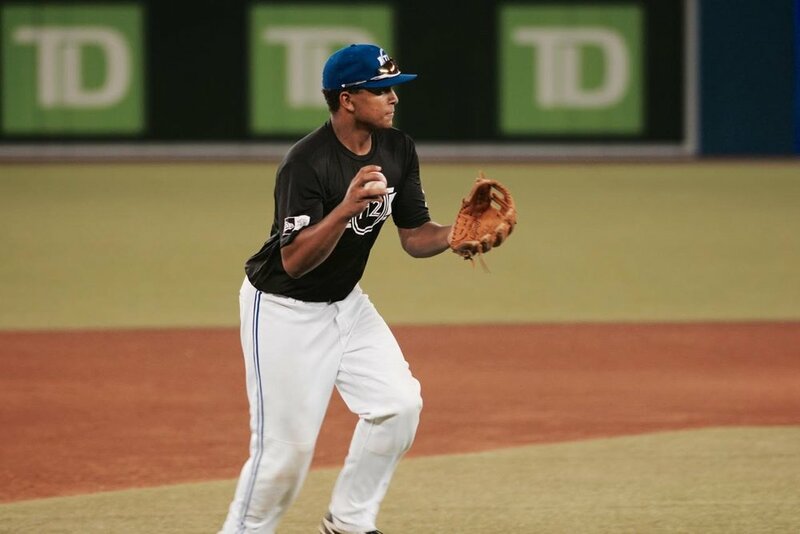 MLB Pipeline:Noah Naylor | Rank: 32 School: St. Joan of Arc (Ont.) HS Position: C Age: 18 DOB: 02/21/2000 Bats: L Throws: R Height: 6’1” Weight: 195 lb. The younger brother of Padres first base prospect Josh Naylor, Noah has a similar offensive profile to his sibling, but with one difference in his overall game: his ability to catch. His combination of a power bat and power arm were on display over the summer and was watched carefully when the Canadian high schoolers started playing this spring. The power bat was definitely on display at Marlins Park in Miami as Major League Baseball’s All-Star Break commenced. On the Sunday morning before the Futures Game his brother would play in, Naylor out-homered top prospect Nolan Gorman in the annual High School Home Run Derby and got to take hacks in between rounds of the big league derby. In game action, he’s shown an advanced feel to hit, giving him the chance to hit for average and power. His defensive game is a bit behind his bat, outside of his arm, which is a plus tool that helps control a running game. To show he can stick behind the plate, he’ll have to improve his overall receiving skills, with many scouts seeing strides in his defensive work this spring. Naylor did play some third base during the Area Code Games and showed some agility there, and there’s always the chance he could join his brother among the first base ranks. The team that takes him early will likely give him every chance to catch at the next level. Naylor is in play much higher than this, as he’s viewed as one of the better pure prep bats available. Scouts are split on if he can catch long term, but he has solid athleticism and a plus arm, so even the more pessimistic scouts feel that he’d be a good fit a third base if he can’t catch. Notes: This will be a crucial draft for the Royals. Their farm system is relatively barren and the major league club is 13-30. Fortunately, GM Dayton Moore and scouting director Lonnie Goldberg will have more pool money than any team ($12,781,900) and five picks before the supplemental second round. Floating a player in the draft under the current CBA is more difficult than it used to be, and that could be especially true this year for the Royals, given Tampa Bay’s first pick at 16 and $12,415,600 pool. A number of prep pitchers should be available here and the Royals have gone that route before, but they have spent a lot of money on players of that demographic that have not worked out. Most notably Ashe Russell ($2,190,200) and Nolan Watson ($1,825,200) with first round selections in 2015. Naylor has an argument as the best bat in the class, has a track record against professional arms and is also in the mix at higher spots than this. His brother Josh’s pro success won’t hurt his cause either. Notes: Naylor has been rising in recent weeks and, given his strong track record against professional hitters with Team Canada, has an argument as the most polished prep bat in the class. 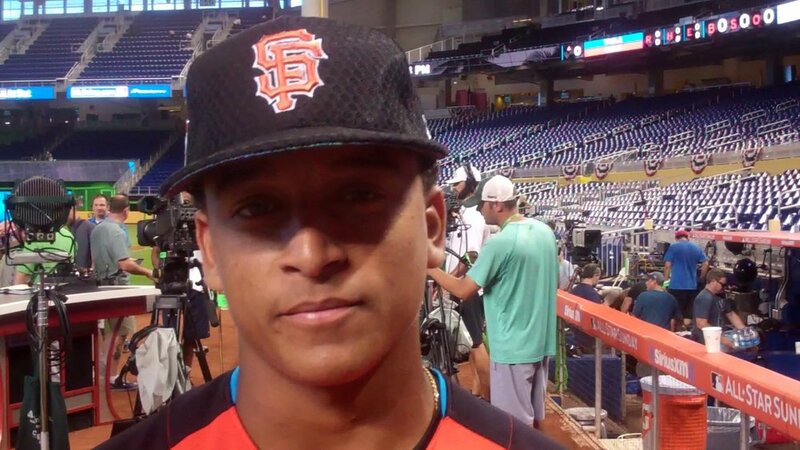 The younger brother of former Marlins first-rounder and current Padres prospect Josh Naylor, Noah has similar power potential and more defensive value as a possible catcher or third baseman. He’s one of several prep hitters mentioned here, along with Adams, Casas and Florida OF Connor Scott. Naylor’s lefthanded bat and very high-level of athleticism have plenty of scouts speculating about whether the top Canadian prospect in the class might be better off starting his career at third base to maximize those two talent areas. The brother of Padres prospect Josh Naylor, Noah can swing it from the left side of the plate as well, with plenty of power potential. There’s work to do to stick behind the plate, but the D-backs are willing to be patient, taking an offensive-minded Canadian high school catcher (Andy Yerzy) in the second round of the 2016 Draft. Noah Naylor at 2017 Tournament 12 ... Photo: Tyler King. The most influential person in his baseball life, besides his father Chris: His brother Josh. 2017 season: World Juniors in Thunder Bay: Two doubles, one RBI batted .313, with .838 OPS ... Selection camp series at Ajax: Doubled, knocked in five runs and hit .321 with a .941 OPS ... National Showcase _ 1.78 pop time (tied for second) ... Ran 6.62 60 (7th) ... 1.49 10-yard split (tied for 3rd) ... 82 catcher velocity (3rd) ... INF velocity 91 MPH (tied for 9th) ... All-American Games: Single, stolen base ... Two run double ... Exit velocity 92 MPH (13th tied) 1.85 pop time ... 82 catcher velocity (1st) ... Perfect Game WWBA National Championship: In a 2-2 count he shortened his swing, got the barrel to the ball and shot a pitch up the middle for a line drive single ... Jr. National Showcase: Had booming triple to centre ... Ran 6.93 60 (52nd) ... 1.87 pop time (tied for 5th) ... Competed at Area Codes Games in Long Beach ... Dominican summer trip: Two RBIs against the Mariners ... Run-scoring single against the Astros ... Batted .195 (8-for-41) with a double, triple, 10 RBIs and a .582 OPS ... Spring trip to Disney: ... Hit .379 with three doubles, seven RBIs and a .983 OPS ... March trip to St. Pete’s: Threw out a Braves runner and had two hits ... Run-scoring single against the Blue Jays ... Singled facing the Jays ... RBI single vs. the Braves ... Hit .136 with .208 OPS. 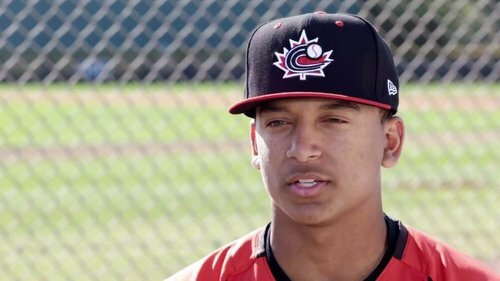 This year's high school draft class features three potential first day picks in Canada's Noah Naylor and the Georgia duo of Will Banfield and Anthony Seigler, all three 2017 Perfect Game All-Americans. That is a rarity for the draft, where teams tend to shy away from the high school catcher demographic due to complexities of the position. The key for all three of these catchers is that they are premium athletes in addition to their playing catcher and none is more athletic than the 6-foot, 195-pound lefthanded hitting Naylor. One senses that that distinction has put him in position to be the first high school catcher to hear his name on June 4. The big question with young catchers, and also shortstops, is whether they can stay at the position defensively as they mature physically and as the game speeds up. Because of Naylor's exceptional athleticism and lefthanded hitting ability, that doesn't seem to be an issue and there is plenty of talk that Naylor might actually be better suited to play third base in order to preserve that offensive potential and athleticism. Although his physique certainly fits that of a young catcher, Naylor is surprisingly quick in his lower body actions and light on his feet. His 6.62-second 60-yard dash time at the 2017 PG National Showcase was eye opening but really not as eye opening as watching him take infield drills at shortstop at multiple events last summer. Naylor brings that athleticism to his work behind the plate but watching his infield actions made it obvious to any observer that he was more than a catcher. Being able to swing a potent lefthanded bat certainly helps, too. Naylor has a very adjustable swing that enables him to both turn on balls to the pull side with authority or to drive them to the middle and left side of the diamond. He sees the ball extremely well at the plate and has that ability to be patient and yet explosive at the same time. Bloodlines certainly don't hurt in this sport, either. While his older brother, Josh, is a very different type of athlete with a much bigger frame and less pure athleticism, they are not dissimilar as hitters. Josh Naylor was always known for his big lefthanded power at the same age but he also had that ability to see the ball, wait on balls then explode to all fields. It is worth noting that the older Naylor is hitting .380-8-25 with 16 walks and 13 strikeouts in 26 games through May 3 as a 21-year old in the Class AA Texas League. While the odds are against younger brother going 12th overall like older brother, the odds are much better than they were a couple of months ago. “In all my years with the national program, he is without a doubt the most polite player I have ever coached.” _ Canadian Junior National Team coach. Canadian catcher Noah Naylor showed some excellent tools. The Texas A&M commit is listed at 6-foot, 195-pounds with plenty of strength on the frame but he is also an outstanding athlete. That athleticism is imperative behind the plate where he showed easy lateral movements and the ability to receive pitches well. The arm strength is also very impressive and he has a knack for instilling fear into runners thinking about stealing second base. His athleticism translates well to endline speed as he recorded a 4.44 second turn and on a jailbreak to the first baseman, he got down the line in 4.12 seconds, an above-average run time. The swing is short and compact through the zone with good bat speed too; he roped a 97 mph double to the pull-side gap. The swing has some fluidity to it and his barrel control is very impressive. He was fooled by a breaking ball in the dirt and still was able to get the barrel head out in front. Naylor’s skill set is very impressive and when coupled with his athleticism and positional versatility, he is near the top of this year’s crop of prep catchers. Noah Naylor is a 2018 C/MIF with a 6-0 195 lb. frame from Mississauga, ON who attends St. Joan of Arc Catholic Secondary. Strong athletic build, good present strength with room for more. Very high level athleticism for a catcher, 6.62 in the sixty, low and flexible behind the plate, very quick shifting and blocked, high level arm strength with a loose and fast arm, 1.78 best pop time. Also played the middle infield with surprisingly good actions and tools, can develop this part of his game further. Left handed hitter, slightly open stance, clean shift into contact and swing, has lots of strength at contact and can drive the ball hard, tends to stay open but can go the other way effectively. Has always performed at high level events against top pitching. Verbal commitment to Texas A&M. Brother of former PG All-American Josh Naylor. Selected for the 2017 Perfect Game All-American Classic. Noah Naylor is a 2018 C/IF with a 5-11 190 lb. frame from Mississauga, ON who attends St. Joan of Arc Catholic Secondary. Strong athletic build, loose and quick actions, different type of athlete than his brother. Left handed hitter, has very fast hands and easy bat speed, front side tends to open early but he keeps his hands on plane with the ball a long time, has shown consistent huge raw power all summer and continued to do so at this event, drives the ball hard to all fields and regularly impacts the ball hard against good pitching. Highest level hitter. Has the tools to stay behind the plate athletically, has quickness in his actions with a compact strong arm, 1.85 best pop time. Is athletic enough to play other positions if he doesn’t catch, looked very good in infield drills. Fun player to watch on the field. Brother of Padres prospect and former PG All-American Josh Naylor, Noah had a very strong tournament from both sides of the plate. Naylor had good reactions with a strong arm behind the plate, coinciding with a 2.14 in-game pop time, and limited baserunners to only two stolen bases in 14 innings. At the plate, Naylor had four hits and showed a good future power. Naylor is one of the top prospects for 2018 and might be the best catcher in the class as well. 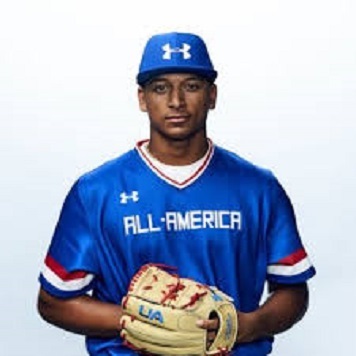 Noah Naylor, the younger brother of former Perfect Game All-American and first round pick Josh Naylor, is very much a high level prospect in his own right with similarities in his swing when compared to this brother. The hands are very quick and loose, two traits that helped produce hard, line drive contact with strength coming off the barrel. Nickname: Big brother Josh used to call Noah ‘Noah-Boah’ it was shortened to Boah and when he started playing ball Josh switched to Bo and the name stuck to the point where teammates, coaches and friends call him as Bo. 2016 season _ World Wood Bat at Jupiter: Showed an impressive 2.14 pop time in-game where he threw out a runner at second base by two feet ... Limited baserunners to only two stolen bases in 14 innings ... At the plate, Naylor had four hits and hit .286 (4-for-14) ... Cuba trip: Two-run pinch hit single to centre ... Singled in win ... Run-scoring fly ball, two singles ... Infield single in loss ... RBI doubled down the right field line ... Homered to right, a two run shot ... Dominican summer tour: RBI single to right against the Twins ... March trip to St. Pete’s: singled against Purto Rico ... Singled three times in three at-bats against the Jays ... two hits against the Astros ... two singles, 2-for-4 against Dodgers ... 2-for-4 facing the Mets ... Extended spring trip ... Singled against Braves ... Double, single vs. Jays ... Singled against the Astros ... Singled against the Nationals. 2015 season, Canada PG Gold _ Batted .375 (6-for-16) with a double, three RBIs, .882 OPS at World Wood Bat in Jupiter. At the junior Home Run Derby at the all-star game in Miami wearing a San Francisco Giants cap ... because Buster Posey is his favourite player. The Brothers Naylor:Noah finished his round at the All-Star junior Home Run Derby and is hugged by his older brother Josh in Miami last July. Numbers: 60-yard dash 6.62 sec (6/16/2017) 95.92% rank ... 10-yard split: 1.49 sec (6/16/2017) 98.80% rank ... INF Velocity: 91 MPH (6/16/2017) 95.05% rank ... Catching Velocity (82 mph (8/15/2016) 98.74% rank ... Pop time 1.78 sec (6/16/2017), 98.50% rank ... Exit Velo: 92 MPH (8/15/2016).